Just like a business relies on a budget meeting to be successful, a family budget meeting is an essential part of getting your finances under control. You need these quick weekly recaps to stay motivated, stay on track, and to get everyone working towards the same goals. I’m willing to bet that your partner isn’t interested in the budget. Most couples are made up of a natural saver and a natural spender. Considering that you’re on the internet looking up budget meetings… I’m going to assume you’re the natural saver. You need your partner! Your potential for wild success skyrockets when you get your partner on board. 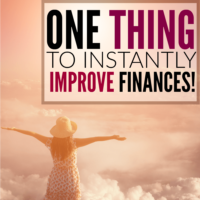 If he’s reluctant, go through the steps found in this article first before you set up your budget meetings. Trust me on this, a little extra work up front to get the reluctant spouse involved will pay off in a huge way. Let's cover the basics and then I'll give you step-by-step instructions you can follow to set up your own meetings. What should be accomplished during a family budget meeting? You want to establish how much you are allowed to spend and in what categories. 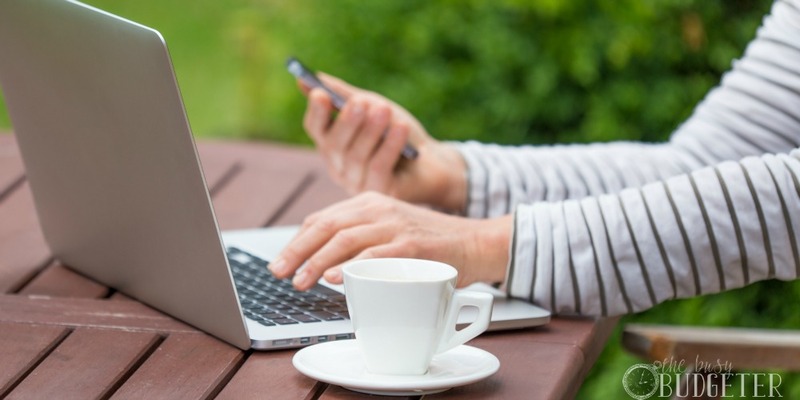 You want to review prior spending and whether you stayed on budget. You want to identify problems and brainstorm solutions. You want to mention your goals and track your progress to them. How long is a family budget meeting? 20 minutes. If you both love chatting and want to make it longer, that's okay too. As a rule, cap it at 20 minutes to keep it on pace and fun. If it’s longer than 20 minutes, it can become something that the “natural spender” dreads. How frequent should a family budget meeting be? Weekly. The first weekly meeting of the month should also cover a quick monthly recap (about 5 minutes) of the previous month. Meetings should be consistently on the same day. For example, Mondays after dinner, Saturdays after breakfast, etc. This is important because without consistency, it’s hard to make this a habit. Remember, this doesn’t have to be a huge event though. It’s just 20 minutes. Who should be involved in a family budget meeting? You and your partner. It can be incredibly empowering for older children to be involved as well, but make sure you keep it positive if you do that. You want them to walk away from the meetings feeling like part of a team, not having them worry about money. Who prepares for the family budget meeting? The natural saver. The person who is “in charge” of the budget, (I use that term loosely since you're both responsible for the budget). If neither of you enjoy doing it, then assign it to whoever has more free time. How do I prep for the family budget meeting? Follow the instructions found in this article to create your budget. 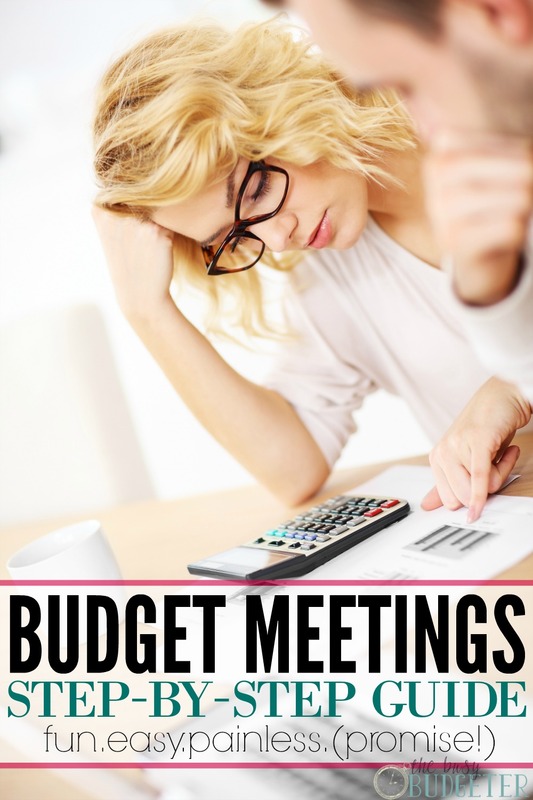 Bring the budget to the meeting in a way that can be reviewed and changed by your partner. That can be on paper, a printed report from a website or spreadsheet, or just an app on your phone that you can pass back and forth. I will say that I love having paper and pen for this. Even now, 6 years after our very first budget, we still use paper and pen for budget meetings. 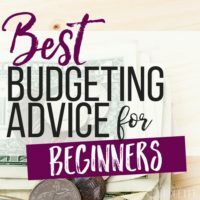 If this isn’t your first budget meeting, make sure that your budget is “up to date” with actual spending, so you know what you spent versus what you planned to spend. (You can find instructions on how to do that in our creating a basic budget instructions). Do I need a budget binder? Where do I track my budget? You certainly can have a budget binder. My caution would be that sometimes we’re more interested in “getting organized” than actually being organized. You can track your budget in a planner (my favorite way to do it), or even a piece of paper. If you have some experience in budgeting, you can look into my recommendations for tracking a budget here. My preference is that you would wait on the budget binder until you’ve been through a few meetings. That lets you see what you actually need and prevents you spending hours of your life (and money) setting up a binder “just perfect” and then not actually budgeting. I want your focus to be on the budget, not the binder. If you just can’t help yourself… Here’s a good example of a budget binder. What happens during a family budget meeting? 1. Have your partner review the budget and suggest changes. Be open to changes that they want to make. The worst thing you can do is to shut down every suggestion they make. This is a partnership, not a dictatorship. If you struggle with that, this article may help you. 2. Agree on a final budget with any changes needed. Transfer any money needed right there during the meeting (i.e. If your budget has discretionary money or “fun money”, you can give that out right then so it’s consistent and they know when to expect it). Example: I can stick to this budget. I’ll go through and set up auto pays for the bills through the bank. Here’s $100 to spend as you like this month. 3. Review your spending from last week and give a “state of the budget address” (I’m only kind of kidding). Just mention if you’re on track, any unnecessary spending (without being angry or pointing fingers) and brainstorm ideas to prevent the unnecessary spending in the future. Example: We did great in other categories last week, but we spent $60 for Suzie’s field trip that wasn’t budgeted. Why don’t we start budgeting in $25/month for school expenses for the kids? To cover things like bake sales, field trips, musical instruments. That way we aren’t surprised when that happens. 4. Quickly mention your goals and any progress towards them. Example: We’ve got $4,500 left on our credit card! That means we’ve paid off $18,400 in the last year! 5. If it’s the first budget meeting of a new month- give a quick monthly recap. Were you under budget or over budget? Mention how your goals were affected. Example: Last month, we were under budget in groceries by $100, so we put that $100 to an extra debt payment! That moved our projected “debt free” date up a month so we should be debt free in 8 months! Important note: It is completely normal to be over budget, especially in the beginning. Budgeting is a life skill. And just like you don’t get mad at your 1-year-old when she doesn’t immediately know how to walk the first time she stands up, don’t get mad at yourself if you struggle. Accept what happened, make changes to get a little bit better and move on. I’m not looking for perfection the first time, I’m looking for you to be better than you were last month. That’s it. Next month… I want you to be better than you were this month and so on. 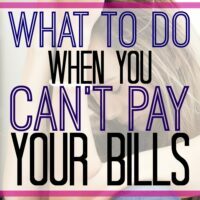 You can read more about what to do if you’re over budget here. Are you the type that has trouble getting started? This section is for you! Just complete step #1, then keep going with each additional step. 1. Decide if your spouse is reluctant… if he is, read this first and then come back. 2. Schedule a time to hold your first budget meeting (about a week from today to give yourself time to prepare). 3. Head here if you don’t already have an established budget. Create your first budget based on those instructions. 4. Track you’re spending at minimum weekly, but daily makes it really easy to stay on top of it in just a minute or two. (Not sure how to track your spending? Read this). 5. Set up some guidelines for your meeting. The meeting won't be more than 20 minutes, and write out what you’ll cover: Review the budget and make needed changes; Review last weeks/month spending; problem solving through pitfalls; and goal progress. 6. Bring your budget to the budget meeting and get ready to see some major changes! What financial goal do you want to tackle this year? We have been doing weekly Family Budget Meetings for three years now. Great to see a guide to help. I am a strong believer in these meetings and I am happy to see support from you. This is SO amazing. I was taught how to budget by my parents. 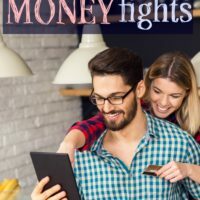 We never had a family budget meeting (they are extremely private about their finances, but they helped me to learn personal financing as I grew up. My husband was the baby of the family and for whatever reason was not taught how to finance. He dumped everything on me. I felt really alone, and kind of like his mother. (Because I had to teach him how to do anything when it came to money, tell him yes or no, and when I’d give him a budget he would always overspend it). These family meetings saved my marriage. We now have a travel budget and have figured out our priorities. Thank you for this! Hi Rosemarie! This article is going to save so many families. I find that financial problems actually create more issues than anything in a family. Your budgeting steps are very clear, very comprehensive. You should do more articles like this! We have been doing weekly Family Budget Meetings for three years now. Great to see a guide to help. definitely going to look into it. Really very useful tips are provided here. Thank you so much. informative and helpful content thankss…. Everything that you write is awesome but most awesome thing is the Coffee. 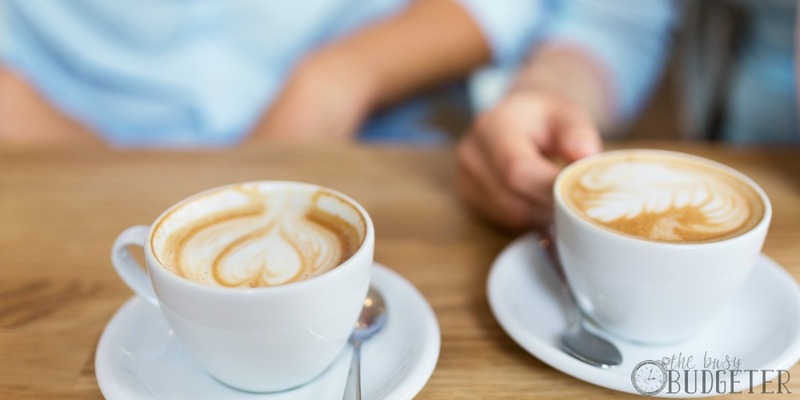 I love your coffee. Thanks for sharing this. Your article is amazing. Every time you write that makes a level of you. Me: Starts waving hands wildly!!! That was honestly the hardest part about starting a budget, keeping my family from ruining it accidentally. They mean well but with 4 siblings, it’s not crazy to be asked for money several times a month and saying no to the ones you love is super hard. But cutting that cord isn’t just helping me but them as well. Enabling helps no one.